Knowing how to brine your turkey will ensure that you have a tender, juicy and flavorful bird no matter what cooking method you use. There are many different brining recipes, but the method remains basically the same. While you won't need a lot of special equipment, there are a few things you will need for the brining process. Choose a container big enough to hold the turkey and allow it to be covered by the brining solution. Don't use aluminum or copper; a large, stainless steel stock pot, an enamel pot or even resealable plastic bags work well. Many restaurant supply stores carry food grade plastic containers that are big enough to seal a turkey in as well. The container should have enough room that the turkey can be turned and completely submerged in the liquid. Kosher salt is the best to use for the brining process because it is pure and there is less of a chance of off flavors seeping in. Use approximately one cup of Kosher salt, one half to one cup of sugar and your preferred spices to one gallon of water. Adjust to cover the turkey; you have the right brine ratio if a fresh egg will float in the brine solution. Clear a space in your refrigerator large enough that the brining container can fit inside of it for the brining period. If that isn't possible, you can brine your turkey in an ice chest; just fill the chest two thirds of the way full with the brine mixture. Add your turkey and a bag of ice (leave the ice in the bag). Make sure that the lid stays closed, but check it once in a while to make sure your brine is around 40 degrees farenheit. Start with a completely thawed turkey. Clean it just as you would if you were getting ready to stuff it. Take out the bag that contains the neck and giblets and set aside. Place the turkey in the container you have chosen; remember that the container should be bigger than the bird. Pour in the brine solution until the turkey is completely covered. Put a top on the container and put it into the refrigerator for one hour per pound of turkey. Be mindful of the time; it is important that you not brine the turkey for too long. Many books recommend that no meat be brined for longer than twenty four hours no matter how large it is. If you have any doubt, it is better to take it out a little early. Remove the turkey from the brine mixture and rinse it thoroughly, inside and out. There should be no trace of the brine on the skin or inside the turkey. If you aren't thorough in this step the bird will be very moist but very salty! Drain the turkey and pat dry. Use paper towel and soak up as much excess moisture from the skin and cavity as possible. Proceed with how you usually prepare your turkey and cook as usual. 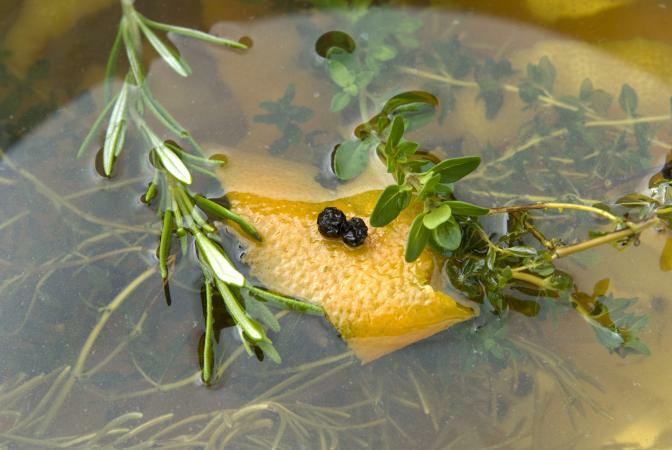 Here are a few brine recipes that you may want to try. By knowing how to brine your turkey you will find that even the breast meat stays moist and flavorful. You can brine any bird in this way from chicken to duck and it is the best way to get a perfect result every time. Other meats that can be brined are pork and fish.